I use impersonation on a regular basis for a number of different tasks. This one is pretty basic but can make a big difference in how you handle security. Let’s use a very basic task as an example. We are going to create a stored procedure to do the truncate for her. One of the options when creating a stored procedure is the EXECUTE AS clause that causes the sp to run as if another user had actually run it. We proceed one of two ways. Create a new user, generally SQL Server authenticated, just for this purpose. Grant the user alter permissions on the table to be truncated. Write a stored procedure that does the truncate on the table. Use the EXECUTE AS ‘UserName’ clause in the stored procedure. Grant EXECUTE permissions on the stored procedure to the user that needs to truncate the table. Now when the stored procedure runs it will run as if it’s UserName and has UserName’s permissions. Therefore it will be able to truncate the table. UserName can also alter the table, but we aren’t sharing UserName’s password with our devs. The other way, simpler, and in some ways more secure, is to use EXECUTE AS OWNER. As long as the owner of the schema of the stored procedure and the owner of the schema of the table are the same then no explicit permissions or special user are required. To explain that another way when we use EXECUTE AS OWNER the stored procedure runs as if it was the owner of the stored procedure. So if the stored procedure is in the dbo schema, that happens to be owned by dbo the databases owner, then the stored procedure is run as if it was being run by the database owner. That doesn’t sound overly safe does it? It helps if you understand that the only people who can create a stored procedure that impersonates another user are the people who have the ability to impersonate that user. So in this case the stored procedure will probably be created by a DBA who is a member of db_owner or sysadmin. 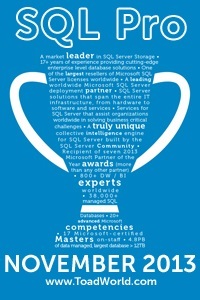 That DBA can control exactly what the stored procedure does, so there is no more risk than anything else a DBA can do. « When was this database restored? I’ve generally created a User WITHOUT LOGIN to use as the execution context, just for this purpose. Not a bad idea. Still requires impersonation to use and drastically limits permissions available. I like it. Thanks for the comment! Very nice, concise article ! Thank you !! Glad you liked it! Hope it was helpful. Anthony, do you have a naming convention for your impersonation user? Also, Kenneth, could you write article with describing your name conventions for SQL Server and T-SQL programming guidelines?